It is presumably safe to say that terms such a “MON 810”, Amflora and “Maize 1507” do not mean all that much to the average person. Yet all three are the result of one overriding principle, which is a contentious area of ongoing debate: genetic engineering. MON810 et al are genetically modified maize and potato crops. These crop varieties have either already been grown in European soils or the decision on whether to allow their respective cultivation is set to be made shortly. Many people in Germany are uneasy about the thought of GM food on their table. The FocusTopic published in June, which put attitudes to nutrition in the spotlight, already revealed that 52% of Germans have a preference for foodstuffs that are clearly labelled as being GM free. But how well acquainted is the population with the concept of GM food really? What do people associate with this technology? The GfK Verein surveyed around 2,000 people, asking about their knowledge on and attitudes toward all things to do with genetic engineering in order to answer these questions. The findings were quite clear: the majority of Germans have come across the term “GM food” in the past. However, not all had a clear picture in mind of what exactly this expression encompasses. Genetic engineering techniques, for example in agriculture, cause a stir on a regular basis, at least where the media is concerned. This has led to an increasingly widespread recognition of this term. 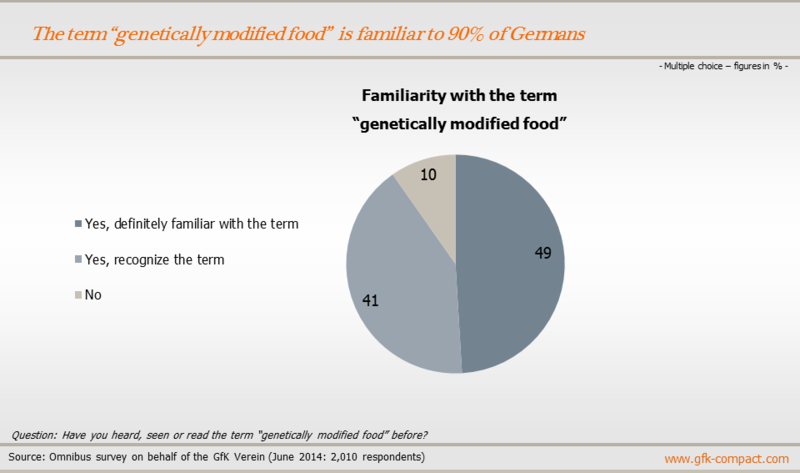 “GM food” is an expression which 90% of Germans are already familiar with, having heard, read or seen the phrase being used somewhere at least once – 49% of respondents went further, specifying that they were completely sure they had encountered the phrase. In contrast, the expression was unfamiliar to just one in ten respondents. 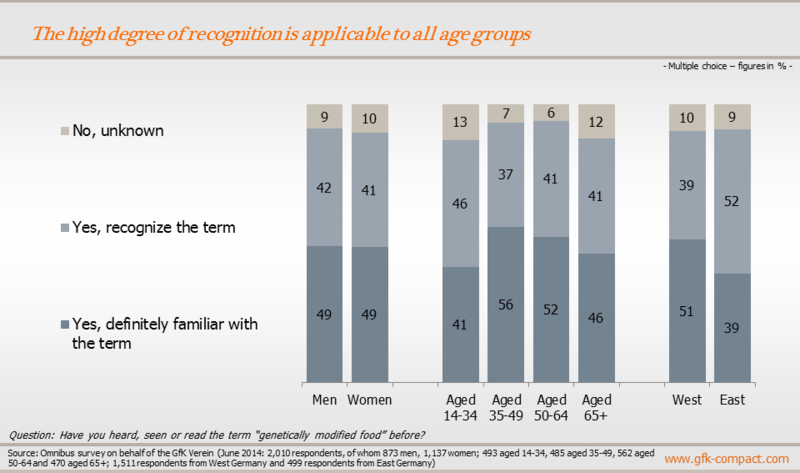 This high degree of recognition remains relatively constant through all population groups, irrespective of age, gender or region, with only minor differences to be identified. The responses from those in the 35 to 64 age category are above average, with more than 50% certain that they were familiar with the term. The younger generation of women (up to 49 years old) tended to be better informed than their male counterparts of the same age category. This trend is reversed later in life: from the age of 50 onward, it is the men who lead the way with regard to awareness and recognition of this term. Associations: beneficial or in need of banning? Advocates of genetic engineering processes see this as a way of curing hunger and malnutrition, whereas its critics opine that it is simply an unnecessary interference in nature, which can have unforeseen consequences for humans. However, this survey aims to discover what exactly the German population think of when confronted with the issue of GM food? Respondents who intimated that they were au fait with the term are divided on this subject with their answers reflecting a diverse range of attitudes. Several negative associations ranging from “unnatural/artificial”, to “damaging” and “unsafe/risks” were expressed, but were counterbalanced by a similar number of positive and neutral associations. This can be seen in the fact that every fifth respondent was completely neutral in their attitudes toward GM food where the taste or appearance has been changed. 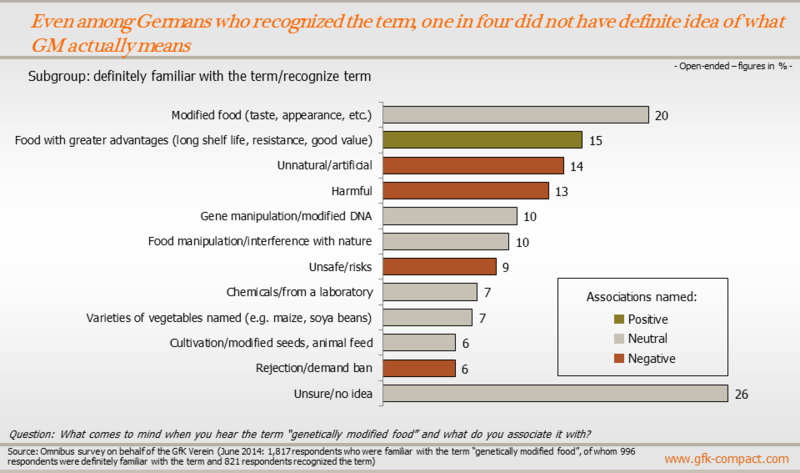 Gene manipulation and alterations in DNA were viewed as important issues by one in ten respondents, while others were concerned with processed seeds and animal feed. Overall, 15% of respondents expressed a positive view of GM products and plants, associating benefits such as extended shelf life, resistance and good value. Purchasing GM food: yes, no or maybe? A look back over the past decade reveals that German citizens have become a little more critical in their attitudes towards GM food. 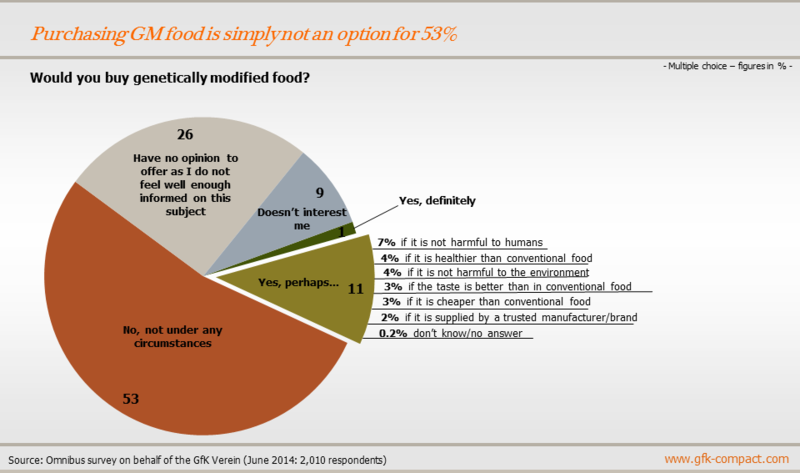 In 2004, 44% of respondents definitively ruled out buying GM food, whereas that figure has now risen to 53%. Nevertheless, it’s clear that not all Germans reject this technology out of hand. Even though just 1% of respondents would have no hesitation in buying GM products, a further 11% could imagine themselves doing the same if certain conditions were to be satisfied. The potential buyers’ primary focus in this regard is on the health benefits and safety of the products. They should be harmful neither to humans nor to the environment, and should be offer as many health benefits as possible over traditional foodstuffs. In addition, improved taste, value for money and a trusted producer are factors which could play a role in the purchase decision. Another group of consumers were sat firmly on the fence with regard to GM food, explaining that they would like to be better informed on the subject before forming a definitive opinion. One in four admitted that they didn’t know enough to offer an informed opinion on the issue of buying GM produce. There is both an interest in and need for more information on this subject given that there has been no change in the percentage of this group since 2004: it remains at 26%. However, the ratio of GM objectors, potential buyers and those who have yet to form an opinion one way or the other has shifted slightly in comparison with 2004. The percentage of potential buyers has decreased from 17% to 11% today, while those who object to GM food increased proportionately. Nevertheless, it is worth pointing out that the subject in general is still as hotly debated as ever, as shown by the decreasing number of respondents who claim to have no interest in the role of genetic engineering in food (2004: 12%; 2014: 9%). “Maize 1507”, a type of genetically modified maize plant, could soon receive authorization from the European Commission. This would represent the first approval for genetically modified maize within the EU for more than 10 years. Even if it is granted, individual member states can still opt to enact cultivation bans for the crop. In this respect, it still remains to be seen whether this crop will in fact be grown in European soils. It appears consumers are less sure, as demand for information on “Maize 1507” continues. Public bodies such as the German Federal Ministry for Economic Affairs and Energy and the German Federal Office of Consumer Protection and Food Safety have reacted to this, explaining on their websites how GM content in foodstuffs can be identified and what the voluntary “GM free” label, provided by the Association of Food without Genetic Engineering really means. Furthermore, the 'Barcoo' smartphone app provides additional support to supermarket shoppers who wish to discover more about what may be hidden in products. This barcode scanner provides the user with a whole host of product information, including data on genetic engineering. If you have any queries please contact Claudia Gaspar (claudia.gaspar@gfk-verein.org) or Claudia Stürmer (claudia.stuermer@gfk-verein.org).